My travel group played Tiger’s Eye on Wednesday, June 20, 2012 as an afternoon replay from a morning round at the premium course (Leopard’s Chase) at Ocean Ridge Plantation. Located in Ocean Isle Beach, NC, if you are playing the Big Cats, make Tiger’s Eye your first and foremost destination. 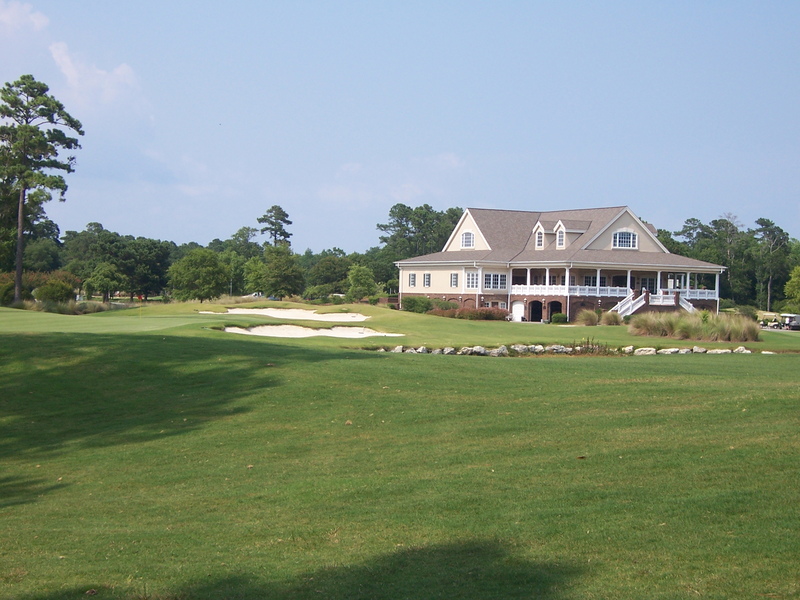 It’s the number one course at Ocean Ridge and is in my top five in the Myrtle Beach area. I played the course three times in 2009 and our return trip this year did not disappoint. 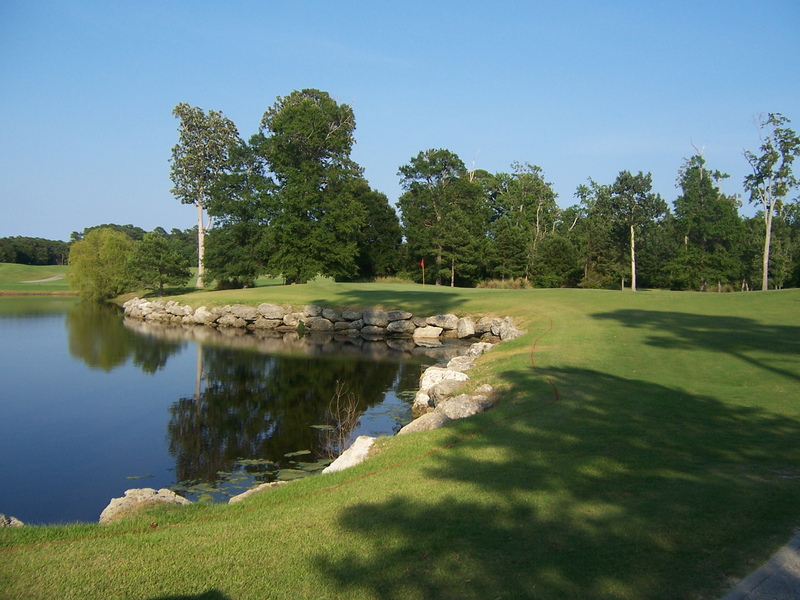 The course is a fabulous layout that combines large natural waste areas with some well placed bunkering and forced carries over water, and interjects a mix of very drivable wide open landing areas with careful meandrous routing among the tall pines. No two holes are alike and you’ll be struck by the natural beauty of the landscaping and the unique challenge of some of the greatest holes in Myrtle Beach. The bentgrass greens were rolling a little slow as the course was trying to keep them from getting stressed in the hot weather, but otherwise, our playing experience was perfect. #1 is a short and seemingly benign dog leg right par-4. Do not miss your tee shot right because the woods and fairway bunkers can turn this into a struggle. 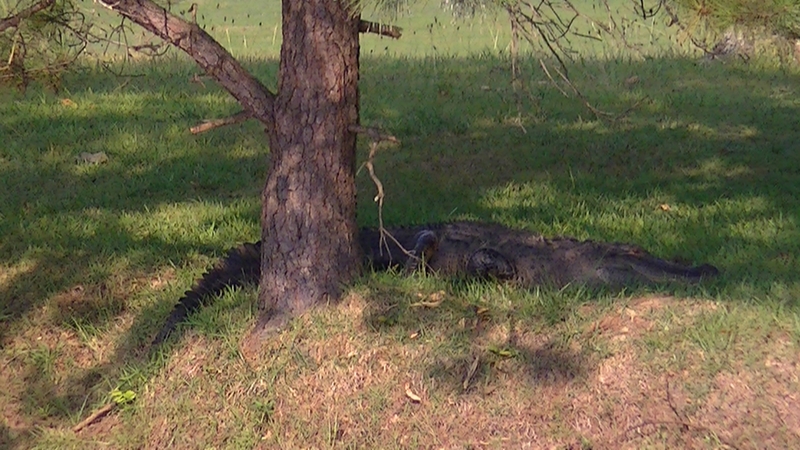 There is plenty of room left in the fairway. The par-3 second hole plays uphill and long so take one to 1 ½ extra clubs; it’s all carry. #4 is a beautiful par-4 with a split fairway. You’ll need about 220 yards to carry the water if you choose the left (shorter) fairway. Otherwise, play to the right but avoid the approach from the large waste bunker in the middle; it makes the hole needlessly difficult. The par-5 seventh has room beyond the right fairway bunker on the tee shot, so pound the driver and get as much distance as you can. Good scoring opportunity here. The par-4 ninth has a forced approach over water. Avoid the right side on the tee shot because if you hit the fairway bunker, clearing the hazard on the second is difficult. On the back-nine, #15 is one of the best par-5s in Myrtle Beach. Your second shot here is the key and must be placed on dry land. When playing into the wind, this hole can be as brutal as it is beautiful. On the par-3 17th, take the middle of the green which is a great play for any pin position. The green on the par-5 18th is very undulating. Two precision shots are required to give you the best chance to get it close. If you don’t a three putt is very likely. We played in the afternoon on a $45 replay rate which was an excellent value considering the quality of course. The regular summer greens fee is $72 is also an excellent value. High season rates go over $100 but for summer golf, you cannot beat Tiger’s Eye. Tiger’s Eye boasts a huge and fully stocked clubhouse, pro-shop, and full service grill. There is a practice putting green adjacent to the cart staging area which is ample enough for warm-up but they do not allow chipping. There is a separate pitching area and driving range that is shared with Lion’s Paw and Panther’s Run that is accessible by cart. The clubhouse is dedicated to Tiger’s Eye, as Lion’s and Panther’s share a separate facility. We ate lunch on the clubhouse veranda overlooking the 9th and 18th greens. The food was good, the service a bit slow, and the panoramic view excellent. Oddly enough, the view was obscured a bit for those sitting at the tables by the large top railing, but in the grand scheme of things, this was inconsequential. Scheduling replays from any of the Ocean Ridge Plantation Courses at any of the others was a breeze. We had 3:00 p.m. reserved at Tiger’s and when we arrived, they were cognizant of our standing and had us set up and ready to go on time after we ate lunch. The pro-shop staff, starter, and beverage service attendants as well as the ladies working in the grill were friendly and accommodating. We had the course to ourselves all afternoon and thoroughly enjoyed our day. For the record, I played the blue tees at 6,628 yards and shot a five-over par 77. 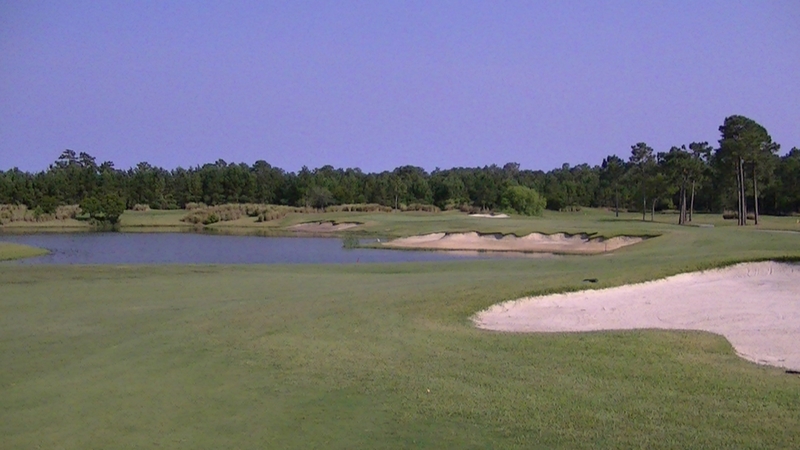 For summer time golf in Myrtle Beach, Tiger’s Eye has my highest recommendation. This entry was posted in Course Reviews, Myrtle Beach, North Carolina, Travel and tagged course reviews, Golf, Myrtle Beach, sports, Tiger's Eye. Bookmark the permalink. Looks like a very pretty course. Thanks for the insights! I’ll put it in my list of “must plays” in the Myrtle Beach area. Tony, Tiger’s Eye is an awesome course. Loved it every round I played on it. You will too, good luck! Nice post, I have never been to Myrtle Beach, but maybe one day. Thanks! If you ever get to the U.S. and are looking for the best golfing value out there, go to Myrtle Beach. You can get an awesome week-long golf vacation for under $1,000, which includes lodging and golf. If you’re serious about it, let me know and I’ll hook you up with the group who we book with every year.